Spyderco Centofante Plain Edge Knife C155TIP. Centofante Memory Titanium Plain. Comes in a black leather zippered pouch with velvet lining inside. 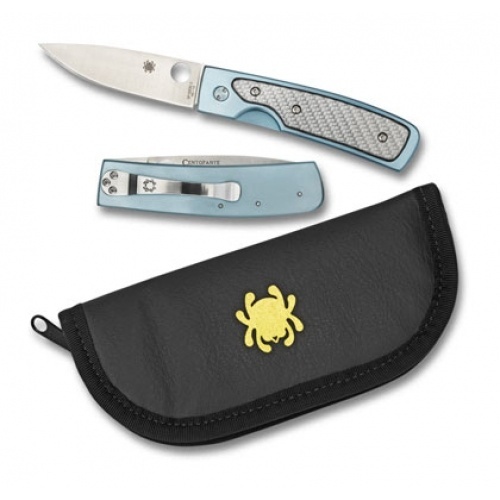 Light Blue colored handle with titanium shell in the middle. Blade is three inches long and made of VG-10 Steel in Seki City Japan. Has "CENTOFANTE" engraved on the back of blade. Silver pocket clip. Liner lock system. Do you own Spyderco Centofante Plain Edge Knife C155TIP? Tell us about it! Have a question? Ask!